Nestled between the gateways of the Colorado National Monument is our family operated winery. Although Two Rivers Winery and the Chateau are relatively new, they are both becoming Grand Junctions Newest Tradition. The entire project was built literally from the ground up on 15 acres of vacant land in 1999. Located in the Redlands area of Grand Junction, we offer wines of the noble varieties, which can be tasted and purchased in the intimate setting of our tasting room. Come enjoy an enlightening tour of the facility or pause to take in the unimaginable views. You are invited to sample our award winning wines and to discover a truly unique and unpretentious tasting experience. The owners, Bob and Billie Witham, natives to the Western Slope of Colorado, are often available to say hello and welcome you. 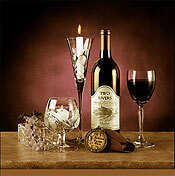 The Winemaker is usually on hand as well, and invites any inquiries regarding the winemaking process. Our hours of operation are Monday – Saturday, 10:30 a.m. to 6:00 p.m. and Sunday, 12:00 p.m. to 5:00 p.m. The last tasting is at 5:30 p.m. Monday – Saturday, and 4:30 p.m. Sunday. Closed: New Year’s, Easter, 4th of July, Thanksgiving, and Christmas.